In 2017, Apple iPhone X came up with Gesture navigation by ditching the traditional Touch ID. After that, Android devices like Google Pixel, OnePlus, Xiaomi etc. The good thing is that with the help of some third-party gesture apps, you can add iPhone X like navigation gestures on any Android smartphone. Well, if we look around, we will find that Gesture feature on Android is slowly becoming a new trend. Now all smartphone comes with gesture support. Not just that, but with Android Pie, Google has introduced all new Gesture navigation. However, Apple is the first one to introduce the gesture navigation feature. In 2017, Apple iPhone X came up with Gesture navigation by ditching the traditional Touch ID. After that, Android devices like Google Pixel, OnePlus, Xiaomi etc. also made smartphones with Gesture Navigation. The feature is really useful because it eliminates the extra space of a virtual navigation button. Now, Google has introduced the navigation gestures with Android Pie and almost all devices running the latest Android OS can use this feature which using any third party app. Fortunately, every Android users can now enjoy the all-new Android Pie or iPhone X Gesture features. It doesn’t matter if your device is running on Android KitKat or Marshmallow, the apps which we are going to list below will help to bring the navigation gesture feature. Below we have shared a list of best Android gesture app that mimics the Android Pie or iPhone X gesture features. You can use all these apps to get the all-new navigation gestures on any Android smartphone. 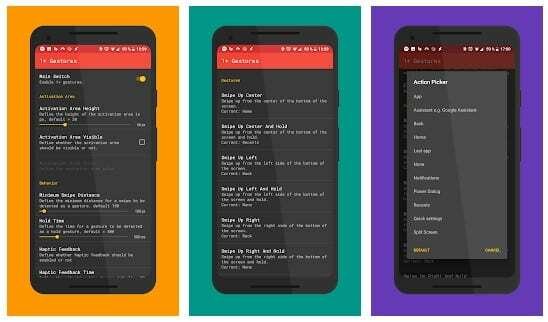 Navigation Gestures is one of the best Android apps which you can use to bring the navigation gestures. The great thing about Navigation Gestures is that it works on a non-rooted device and it hides the stock navigation bar completely. As a replacement, the app adds a pill-shaped button at the bottom which can be customized. Apart from that, Navigation Gestures also offers lots of other gestures. 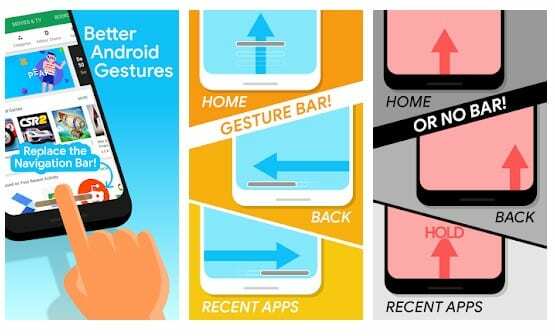 So, if you are looking for an all-in-one gesture app for your Android device, then Navigation Gestures might be the best one for you. Well, One+ Gestures is not the official app from OnePlus community, but its an app made by XDA User which will help you to add OnePlus gestures on any Android device. Just like OnePlus devices, One+ Gestures adds swipe gestures. That means you can now open the app drawer by simply swiping the home screen from bottom to up. The app can also hide the stock Android navigation bar, but you will need a rooted device for that. So, One+ Gestures is another best gesture app which you can use to add OnePlus like gestures. 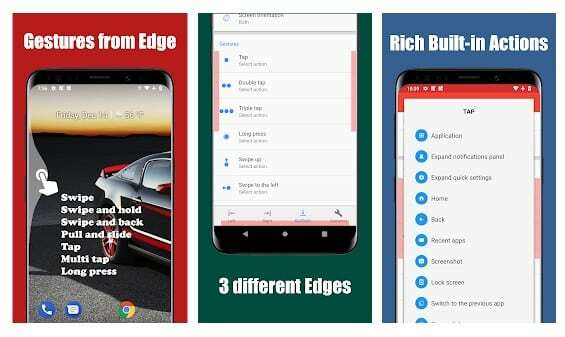 As the name of the app says, Edge Gestures is the gesture app which is meant to add gestures to the edges of your screen. Just like Android Pie, Edge Gestures allows users to use gestures to navigate the previous or next screen. To go to the previous screen, users just need to swipe the edge of the screen from left to right. Similarly, users need to swipe the edge of the screen from right to left to head to the next screen. Apart from that, Edge Gestures also offers other gestures as well as you can swipe up to open the home screen, etc. 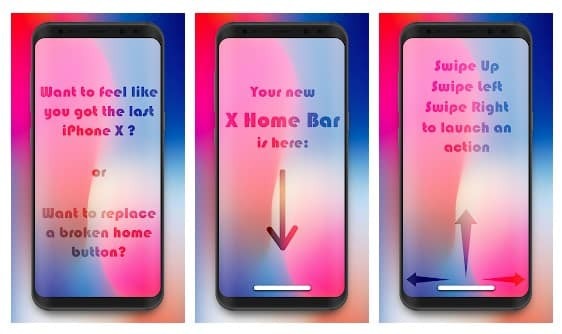 X Home Bar is another great gesture app on the list which adds a pill-shaped button at the bottom just like iPhone X. The great thing about X Home Bar is its interface which looks amazing and pretty straightforward. Another great thing about X Home Bar is that it works even on rooted Android device. So, X Home Bar is another best Android Gestures app which you can use right now. 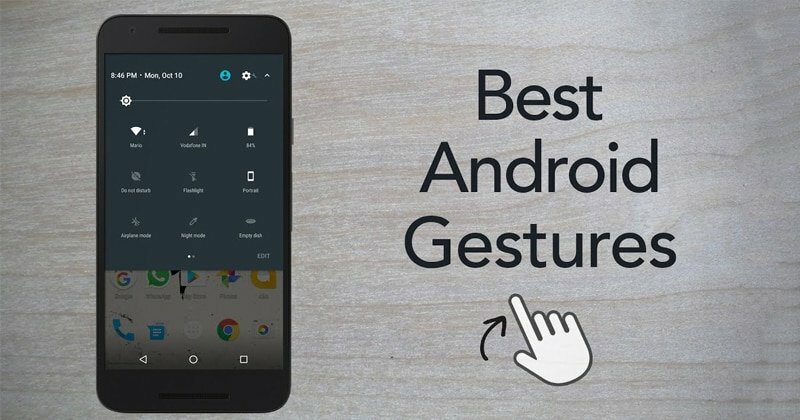 Well, Fluid Navigation Gestures is one of the best and unique Android gesture app that you would love to use. The great thing about Fluid Navigation Gestures is that instead of adding a pill shape button on the bottom of the screen, it ads a fluid button on the screen. The gesture animations are amazing, and it has two primary gestures – Quick Swipe and Swipe and Hold. Swipe and hold will open the open apps, and the Quick Swipe will open the home screen. 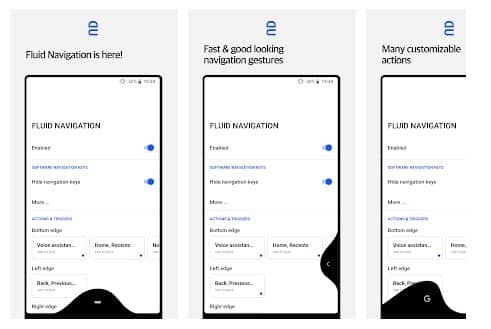 So, Fluid Navigation Gestures is another best Android Gesture apps which you can use right now. 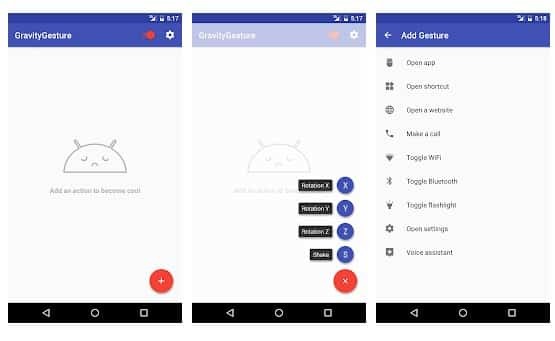 Gravity Gestures is one of the best Android apps which could help you save a lot of time. Guess what? 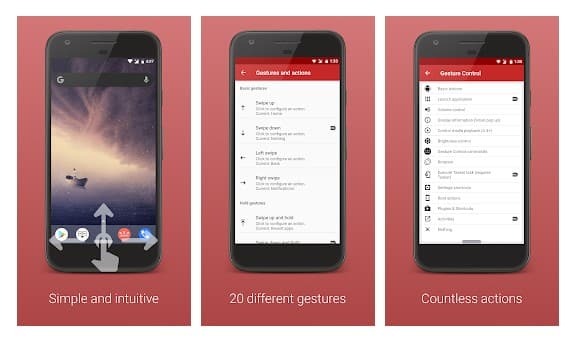 Gravity Gestures brings a wide range of Moto Actions and a lot more on any Android device. There are four gestures in the app – Rotation X, Rotation Y, Rotation Z, and Shake. You can assign different sets of tasks to these gestures. 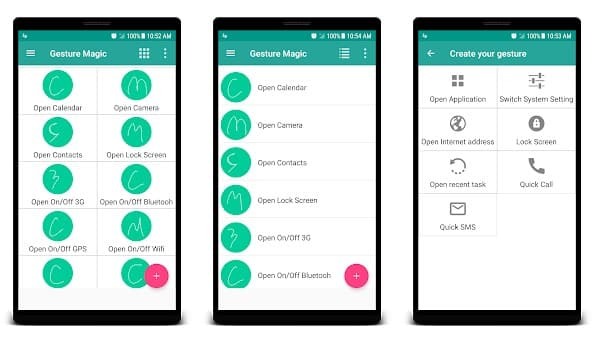 Gesture Magic is another great Android gesture app on the list which can help you to quickly access all applications, settings for devices, etc. The app allows users to set gestures to perform different tasks. For example, you can set a gesture to launch a particular app, make calls, send SMS, etc. If you like the all-new Android Pie’s Full-screen navigation gesture, then you will love Gesture Control for sure. The great thing about Gesture Control is that it can help you to get rid of your navigation bar. Basically, the app replaces the default navigation bar with gesture-based navigation just like Android Pie. 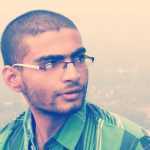 So, Gesture Control is another best Android gesture app which you can use right now. So, these are the 8 Best Android navigation gesture apps which you can use right now. These apps work on every Android device. If you know any other apps like these, then make sure to drop the name of the app in the comment box below.